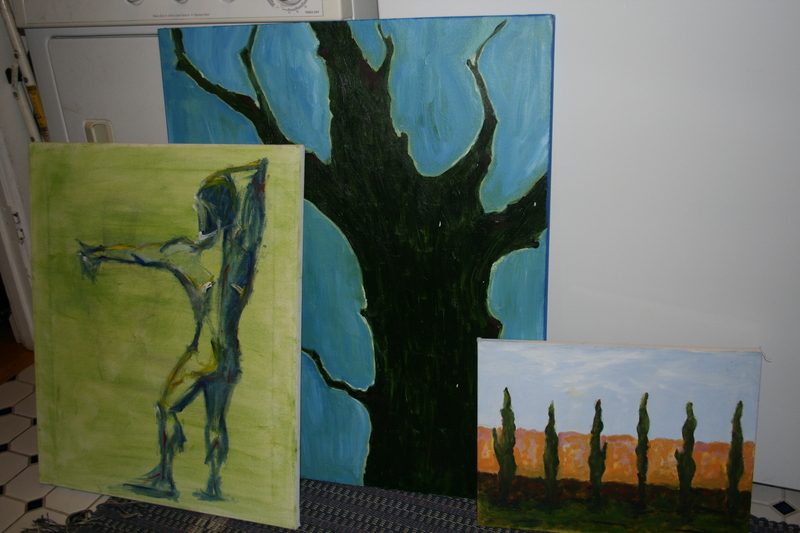 A couple of days ago my wife found three paintings left in the back of one of our closets. I suppose they were left behind by the people who owned this house prior to us. Tonight I threw them in the trash. I was a little squeamish about chucking three works of art. They weren’t especially good paintings. But someone clearly fretted over them to try to make them beautiful. But then I realized that all things are ultimately bound for the landfill. That includes all of us. Our passions. Our stories. Our ideas. Ashes to ashes, dust to dust. Yes, some people today may become the future’s Homer or Shakespeare. But those folks are pretty rare. I once heard someone — I think it was Garrison Keillor — say our offspring are the only tangible thing the vast majority of us can offer the future. But I thought I’d take a photo of those works of art that lingered in a dark closet though they were destined for the dump. Take a look at them and then forget them. It’s the way of (nearly) all art. This entry was posted on March 14, 2012 at 5:03 am and is filed under Uncategorized. You can subscribe via RSS 2.0 feed to this post's comments. You can comment below, or link to this permanent URL from your own site.